Mary MacADNski: These fly agarics seem to grow in little villages. Mary MacADNski: One type of mushroom but at different stages of growth. Mary MacADNski: This is one type of mushroom but at different stages of growth. These are fantastic and gorgeous!!! Great shot! Mary MacADNski: Thanks, Elizabeth. My favorite part of the woods after the ferns. Mary MacADNski: The top shot interestingly is of one type, fly agaric, showing all different stages of development. Mary MacADNski: Almost the prettiest thing in the woods and definitely the prettiest things to pop out of a lawn. Here today, gone tomorrow. They seem to pop up overnight sometimes. Mary MacADNski: In the top shot, we see only one type of mushroom but at different stages of growth. Jolie collection de champignons, ils sont tous très beaux. Mary MacADNski: They are the prettiest part of autumn. 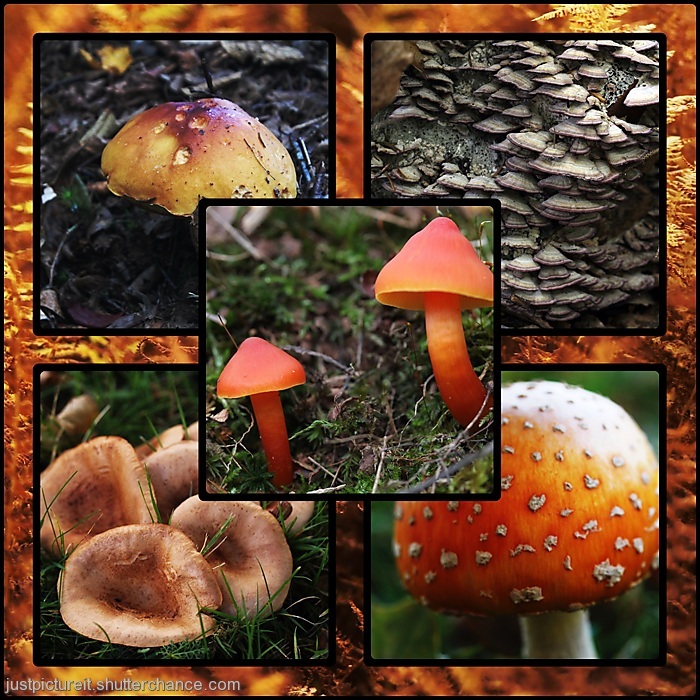 Wow for the top one, even more wow for the lower collage, what a great selection of Fungi. Mary MacADNski: In the top shot, we see only one type of mushroom but at different stages of growth. The bottom ones are all in the woods. Mary MacADNski: I could put those ladybugs that Ruby was play with in amongst the little mushroom village, I suppose. What a nice collection Mary. John Lee and Van, thats a favourite track. Mary MacADNski: I think my kids would all choose the album by the same name as their favorite Van album. It played non-stop for a couple of years. This is a pretty relaxed version of the track on the album. Mary MacADNski: In the top shot, we see only one type of mushroom but at different stages of growth. The bottom has forest mushrooms. awesome perspective. get down amongst it!! Mary MacADNski: Glad you noticed! Once I was down for the shots shown last week, I stayed down there for a while. What a great POV - love it!